The European Golden Shoe is an award given out to the top scorer in European leagues since 1967/1968. The award is handed out by European Sports media. Coefficients are given out to leagues based on their UEFA ranking. Hence, fewer goals scored in a tougher league are ranked higher than more goals in a weaker league. The goals are multiplied by a factor of 2 in the leagues ranked one to five (La liga - Ligue One), while leagues ranked six to twenty one (Russian Premier League - Belarus Vyseyshaya) are multiplied by a factor of 1.5 and leagues ranked twenty two and below are multiplied by one. The award has been won by some of the most legendary players of the past such as Eusebio, Gerd Muller and Marco Van Basten, as well as modern icons like Thierry Henry, Francesco Totti, Cristiano Ronaldo and Lionel Messi who is also the current holder of the award, after winning it for a record fifth time at the end of the just concluded season. 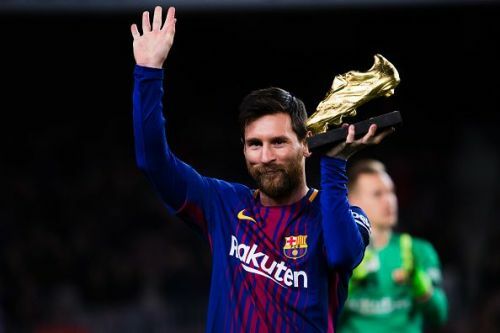 As we approach the midpoint of the European football season, we present the top ten contenders for the European Golden Shoe. The 28-year-old has been nothing short of a striking revelation since arriving the Phillips Stadium in 2014, scoring 78 goals in 138 Eredivisie appearances. So far this season, he has scored 16 goals in 21 appearances in all competitions, with 12 of those coming in just 13 Dutch league matches to help PSV sit top of the Eredivisie, with their only dropped points so far this season coming over the weekend when they lost to Feyenoord. If de Jong continues at this rate, then he would undoubtedly be in with a shout for the European Golden Boot come the end of the season (although he has a distinct disadvantage because of his league's coefficient). Easily one of the best attacking midfielders in the world on his day, Marco Reus can hold his own with the most creative players on the globe, but he has been unlucky with a career blighted by injuries. When fully fit however, few can match the 29-year-old's playmaking abilities, and Dortmund have benefited immensely from having him within their ranks, and at no time has this been more evident than this season. The German international has been at the heart of the enthralling football played by BVB this season under Lucien Favre, captaining the side and providing inspiration from the middle of the park to help Dortmund sit nine points clear at the top of the Bundesliga standings. He has brought his creative side to the fore, contributing four assists to the Dortmund cause, but perhaps even more importantly, he has scored a total of nine goals from just 13 Bundesliga matches, and was on target in the 3-2 Die Klasiker victory over Bayern Munich a fortnight ago.